Launched in Autumn last year, our Spirit of Youth project brought together children from Weyfield Primary School and residents of the Queen Elizabeth Park Care Home in Guildford. After the success of the first term, we’re delighted to be running the project again this term. For a further ten weeks, the participants will form new bonds and relationships, as a new group of children will join the residents to explore another Shakespeare play, the classic love-story of Romeo and Juliet. We have run countless drama projects over the years and there are numerous advantages to running repeat projects. The participants can take the confidence they gained during the first term into the second, which will allow them to access the project from the very first session. Meanwhile, we will use our increased knowledge of their abilities to tailor the process, so it suits their strengths and encourages them to develop further. “It has been wonderful having the children around. I enjoy their company and it brightens my day.” Care-home resident. Participants were monitored throughout the first term to measure the impact Spirit of Youth had on their well-being. The results were staggering, with the 10 residents who participated aged between 69 and 97, showing exceptional improvements in various areas, including their confidence (a 47% increase), mood and well-being (26%) and sociability (26%). The impact on individuals was even more remarkable, with one resident improving their confidence by 300%, their mood and well-being by 300% and their sociability by 150%. “One of the quietest residents, came into her own, when playing the role of Puck, from her wheelchair. She became engaged and alert, flapping her fairy wings for all the children to enjoy, as she cast her magic spells. I couldn’t believe the change in her.” Care-home worker. Progress was equally impressive in the 10 participating children from Weyfield School, aged 7-8. All children were twice as likely to listen to instructions in class (a 112% increase) and express their ideas in the classroom (144%). The children were also more likely to work well with others (91%) and learn independently (71%). The biggest area of improvement was in their confidence with Shakespeare and his text, with children nearly four times as confident at the end of the course (275%). “It was so good to see the young children working alongside the residents. New friendships were built and confidence seemed to grow in both the young and old. Although my mother has difficulty in remembering sometimes, she found it good to have something to work towards and be part of a group production.” Resident’s daughter. Spirit of Youth is part of Brave New World, our year-long programme of outreach projects, which seeks to reduce social isolation and assist disadvantaged schools and individuals across Surrey. Many of the projects are free-to-access pilot-programmes and our aim is to gain further funding, so we can continue Spirit of Youth, indefinitely. 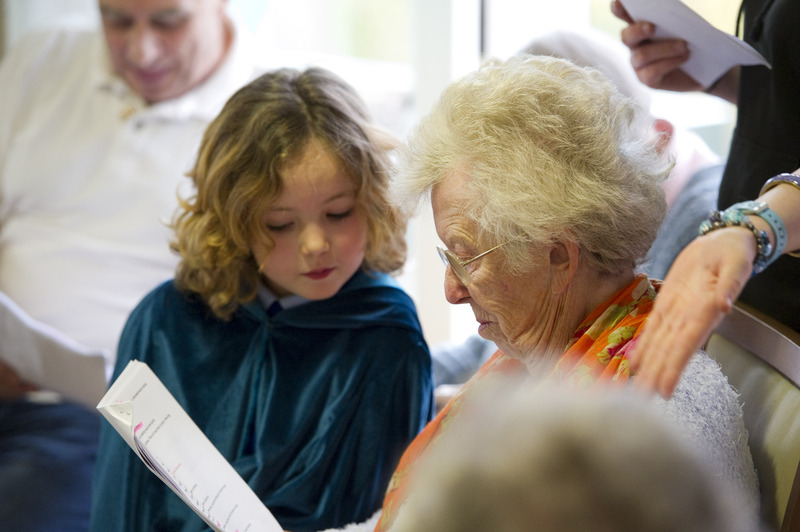 In an ideal world, we would create new partnerships between all schools and care-homes in Surrey. We also hope that other organisations will follow this example and create their own projects across the UK. If you would like to support GSC, please visit the outreach pages of our website or contact us.